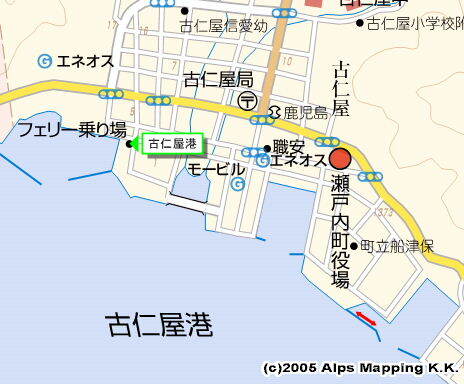 There are three berth areas around Megane-bashi, or Glasses-shape Bridge in English, in Koniya Port. 2) Fishing boats pool in the right of Megane-bashi. There is no visitor space other than one local sail boat. 3) Inside of the quay for Navy ships, which is located in the right, i.e. east, of above fishing boats pool. This is the best place in the three areas. You will see a big iron ladder which red sign says “For Visitors”. Two boats can be moored. 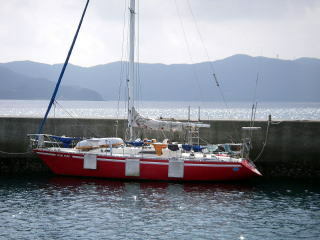 who is running “Umi Kobo Yume-maru” which is a factory for pleasure boats. The above big iron ladder was made by himself for visitors boats. He keeps the visitor space even at the public quay. I took the water from Mr. Kasai’s factory, which is three minutes away. A clean toilet is in the yard of the community hall, which is three minutes away. A western style toilet is six minutes away in a park near Megane-bashi. There is a coin laundry. 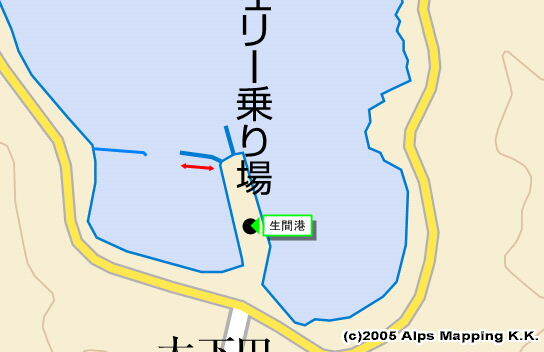 A public bathhouse is seven minutes away near the river. It is a little way ahead of a fast-sold-out shop of cakes. Next to the ferry landing place, there are big A-COOP supermarket and many shops. The delicious and reasonable price restaurant is “Aji-en”. The western food restaurant RECTO had moved to Komiya, because the master fell in love with Koniya. 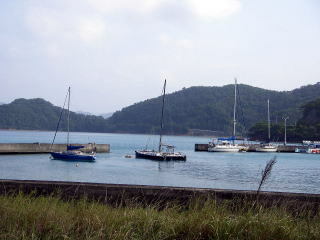 On the opposite shore, there is Ikenma of Kakeroma-jima island which is a small port for the ferry landing. When I visited by ferry, I was surprised that four local sail boats were mooring there. In the outmost area, there were two big foreign sail boats which looked staying for long time. If you want to be there, ask Kasai-san.